This whole week is dedicated to one of my favourite foods in the world – chocolate! 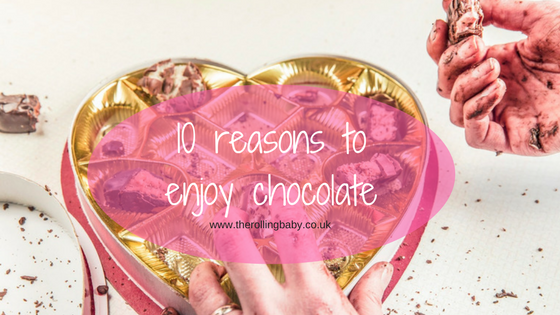 So to celebrate here’s my top reasons why you should forget the calories and enjoy a bar (or two!) this week. 1. Chocolate goes with fruit, think strawberries, chocolate orange and raisins, therefore it must be good for you. 2. Nothing says I love you quite like a box of chocolates. 3. Science says eating chocolate once a week improves your memory. 5. It makes you feel good. 6. It cures any problem you have or at least temporarily helps to alleviate it. 7. It’s versatile – chocolate’s great as food, a body wrap, a drink, in a fountain – the possibilities are endless! 8. There’s so many types to choose from that there will always be at least one that’s perfect for you. 9. Everyone can enjoy chocolate. Manufacturers are increasingly making ‘Free From’ versions, so vegans and those with food allergies can all enjoy the sweet stuff. 10. You never run out of chocolate. It’s one of those items that’ll you always have a bar of in the house.